Many rural healthcare providers have harrowing stories of delivering babies. Dr. John Cullen, a family physician in rural Valdez, Alaska, and president-elect of the American Academy of Family Physicians, shares his story from three years ago. A woman expecting twins entered the Providence Valdez Medical Center (PVMC) on a Friday for a prenatal appointment before planning to leave for Providence Alaska Medical Center in Anchorage that following Monday. PVMC’s policy for multiple-birth and other high-risk pregnancies is to have women stay in Anchorage (a five-hour car ride) for the duration of their pregnancies in case of any complications. That Saturday, she returned to PVMC, a Critical Access Hospital, because she was feeling pressure and found out that – only 31 weeks into her pregnancy – she had already dilated to seven centimeters. The Valdez providers called in a NICU team from Anchorage, but it would take the team 12 hours to reach the CAH, due to a winter storm. If they transferred the woman to Anchorage by air ambulance, they were concerned that she might rupture her amniotic membranes on the way and lose one or both of the babies. Instead, thanks to PVMC’s culture of practicing Cesarean sections, staff were able to perform a C-section and save the mother and her twins. For small communities like ours, if you don’t do obstetrics, you’re still going to do obstetrics. Only you’re not going to be able to handle the emergencies. According to research by the University of Minnesota Rural Health Research Center, many rural areas are losing their labor and delivery units. In 2004, there were 1,249 rural U.S. hospitals with OB services. Ten years later, that number dropped to 1,044. In 2014, 22.1% of micropolitan counties and 69.8% of noncore counties did not have any OB services. Counties with a higher percentage of black people were more likely to lose their labor and delivery units. There’s not one problem, which makes it in some ways a really difficult and complicated problem to solve. In other ways, it presents a lot of opportunities because there are a number of different areas in which to intervene. One challenge includes guidelines that ask facilities to be within a certain distance of another facility that can perform C-sections. If a rural facility is farther away than recommended, insurers may hesitate to provide liability coverage. In addition, OB services are not always reimbursed at a high enough rate for facilities to cover the cost of keeping a labor and delivery unit open. “Medicaid can have low reimbursement rates for obstetric care, and Medicaid pays for more than half of all births in rural areas,” Henning-Smith said. The reimbursement rates vary by state. The low birth volume in rural areas also affects the care these facilities can provide. “There’s a financial issue,” Henning-Smith said, “but more than that, it’s difficult for them to staff a birthing unit if they don’t know how many deliveries they’re going to have in any given week or month.” In addition, the low volume means that employees struggle to maintain their skills, making them feel less confident in delivering babies when they do arrive. The 10-bed PVMC and the Valdez Medical Clinic cover a service area the size of Ohio, and the CAH delivers about 50 babies each year. One family physician has been working in Valdez for 35 years, while two physicians started three or four years ago. Cullen has been working in Valdez for 24 years. 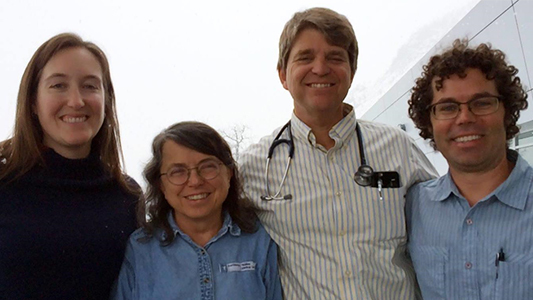 Dr. John Cullen (second from right) poses with the other family physicians at Providence Valdez Medical Center. There have been a lot of close calls, but if we hadn’t had the culture and the team that we have, we would’ve lost [babies and mothers], and that’s just not acceptable. PVMC cross-trains the four family physicians and the nurses in fields like anesthesiology and surgery so that any combination of doctors and nurses can deliver babies. Initially, the CAH’s obstetric services were vaginal deliveries and emergency C-sections. “That was not ideal,” Cullen said, “because it was a lot scarier than it needed to be.” He said that the nurses especially did not feel like they had enough training to be comfortable with the C-section procedure. When PVMC began to perform elective C-sections in 1996, the physicians and nurses went through a number of drills to prepare. “We had a Resusci Annie who had an awful lot of C-sections,” Cullen quipped. During a C-section, a surgeon and assistant perform the procedure while a third physician watches over. Cullen reported that PVMC’s C-section rate in the last five years was 18.6% of all deliveries (54 out of 289 deliveries), compared to the nation’s 2016 rate of 31.9%. He added that the infant mortality rate in his service area is less than 3.3 deaths per 1,000 births, compared to a rural national average of 6.78. Meanwhile, the University of Wisconsin-Madison is working on training the next generation of OB-GYNs. About three years ago, Department Chair Dr. Laurel Rice and her team were able to create the nation’s first rural track in obstetrics and gynecology with a grant from the Wisconsin Rural Physician Residency Assistance Program (WRPRAP). It took two years to become accredited and develop partnerships with rural hospitals in the state. In 2016, UW-Madison began recruiting residents for its new rural OB-GYN residency program. Currently, the program recruits one resident per year, and the program’s first, Dr. Laura McDowell, began the four-year training program in the summer of 2017. The program looks for residents who grew up in rural areas, have completed a rural-based medical program like the Wisconsin Academy for Rural Medicine, and are interested in general OB-GYN (instead of specializing) as well as health disparities in rural communities. She completed an interview along with 11 other applicants. The program invites rural preceptors to the interviews so they can learn more about the applicants, and then the applicants go on a field trip to one of the rural rotation sites. McDowell and future residents will complete 80% of their training in Madison and 20% in rural communities within an hour’s drive of the state capital. “The hope is that exposure [to rural communities] will not only lead them to be more confident in their ability to go out and practice but maybe feel like they’re part of that hospital or community and may even take a job at one of the hospitals they rotate at,” said Jody Silva, Rural Residency Program Manager. Silva hopes that the rural residency program will receive more funding to increase the number of residency spots in the future. “One of the things I’ve learned over the course of developing this track is that people are really interested in it,” Silva said. 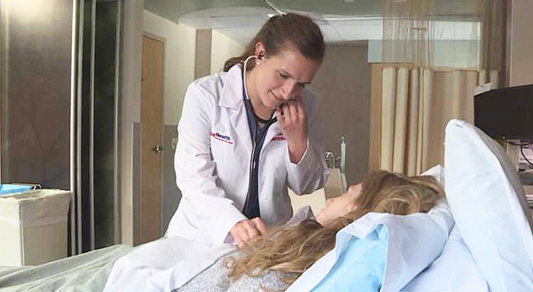 When she holds a booth to promote the new program, medical students tell her that they have seen rural tracks for family medicine physicians but not for OB-GYNs, so they’re excited for this new opportunity. It was really great to have integrated everything that I have learned over the course of this year, and it combines caring for women in both obstetrics and gynecology well. The biggest challenge for McDowell was adjusting from the call experience she had at the academic center. There, she would have a 12-hour shift and then go home, but in Portage she was basically on call 24/7. “I was even shielded from that [24/7 call experience] a fair amount because my attending fielded the calls. Then she would call me in,” said McDowell. Despite the challenges, McDowell and Cullen find their work rewarding. McDowell remembers one patient coming in for a prenatal visit with a higher-than-usual blood pressure reading. McDowell and her preceptor asked her to come in for a follow-up visit. At that next appointment, they diagnosed her with gestational hypertension and recommended inducing labor. Dr. Laura McDowell checks in with her patient. One of the first babies Cullen delivered in Valdez was via emergency C-section in the middle of a snowstorm. Both the mother and baby survived, and Cullen said he just recently saw the son around town. The clinic and hospital in Valdez also nurture a teaching culture. Cullen and family physician Dr. Kathy Todd teach new physicians coming to the area as well as medical students and residents. Teaching the next generation and cross-training the current staff means that medical staff like Cullen and Todd can take vacations or retire someday, knowing that the remaining staff is competent and confident to face any challenges. New physicians also appreciate the chance to teach. “It actually is a better recruitment tool for newly graduated physicians if they know they’re going to be able to still be in contact with an academic center,” Silva said. 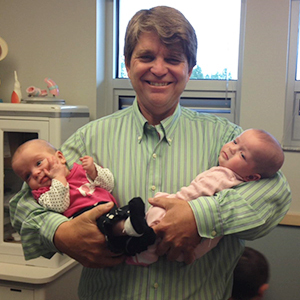 Dr. John Cullen smiles, holding two babies he’s delivered. Cullen added that being able to deliver babies has broader implications for rural hospitals. For example, his staff’s ability to provide pain medication during labor and anesthesia during C-sections means that they can also provide anesthesia for appendectomies and hernia repairs. Plus, the staff’s commitment to cross-training and practice drills allows them to better respond to trauma. “I think that it’s important not to look at obstetrics just in a single silo, to see whether it’s a profitable center for the hospital,” said Cullen. “Rather, look at it from a community and global perspective: what the impact of providing these services has for a community.” For example, young families may be more willing to move to or stay in a rural community if it provides obstetric services. Henning-Smith said that facilities could look into simulations and trainings to help their staff maintain their skills. A scholarship for an OB simulation course is available for family physicians and certified midwives practicing in the rural Southeast. As the number of births outside of a labor and delivery unit increase, Henning-Smith said, first responders should also receive ongoing training on how to deliver a baby. Silva suggested reaching out to teaching centers for help in improving pregnancy outcomes. Even if the centers can’t send a resident, they may be able to assist through services like telehealth. In 2015, Childress Regional Medical Center in Childress, Texas, established a telehealth collaboration with Children’s Medical Center Dallas, about 250 miles away. Telehealth allows the Dallas hospital’s 50+ pediatric subspecialty physicians and neonatologists to remote-monitor babies and consult with CRMC physicians. Cullen advises rural communities to contribute to their hospitals’ and clinics’ loan repayment programs, like Valdez does. In addition to improving community members’ health, continuing OB-GYN services brings in economic benefits. He cited a 2014 study that found that a family physician brings a rural Alabama community an average of $1,000,000 per year in economic benefit. A family physician capable of delivering babies brings in an average of $1,488,560 per year. Mercy Hospital in Moose Lake, Minnesota, is one of only two CAHs in the state to be designated a Baby-Friendly facility. Baby-Friendly designation is a four-phase process, which involves implementing the “Ten Steps to Successful Breastfeeding” and quality improvement activities as well as passing an onsite assessment. Rhonda Skelton, RN, was the obstetrics department manager who began the designation process around 2008, but she passed away before the process was complete. Her staff continued her efforts, and Mercy Hospital was declared Baby-Friendly in February 2018. Skelton posthumously won the National Rural Health Association’s Louis Gorin Award for Outstanding Achievement in Rural Health Care. This entry was posted in Features and tagged Access, Alaska, Critical Access Hospitals, Graduate medical education, Health workforce education and training, Healthcare workforce, Hospitals, Minnesota, Physicians, Prenatal care and obstetrics, Texas, Wisconsin on July 11, 2018 by Allee Mead.